The short answer is to tuck it away. You can put it in a pony tail or otherwise secure it. If it’s really long, you can tuck it in to your jumpsuit or in your helmet. In nearly all cases, long hair isn’t a problem but you do need to keep it from flying around. You don’t want it to obscure the vision of your instructor! Bring a pony tail holder. Plastic headbands, wigs and hair clips can’t be worn. Bobby pins and small barrettes are okay. Most drop zones use soft helmets called “frap hats“. The hat works well for tucking your hair in. Any hair not hidden from the wind will become tangled. Be sure to bring a brush to straighten out the tangles. Skydiving isn’t a fashion show so don’t be too worried about it. If you have really hair (to your waist) you will need to tie it up as much as you can with multiple pony tail holders. It’s also a good idea to braid it and put it inside your jumpsuit or shirt. It’s really important to keep your secure. As 120 MPH hair can go everywhere. If you have any questions, be sure to call the drop zone before your jump or ask when you are making the reservation. 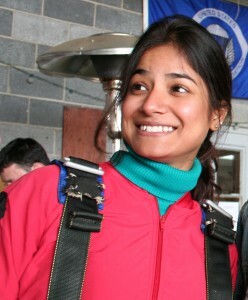 Hair is rarely, if ever, a problem and should not prevent you from making a great skydive.